BBE Sound powered by Plugivery are proud to introduce Stomp Board. The Free Fuzz was patterned after a rare and sought-after silicon transistor fuzz pedal made famous by players like Jimi Hendrix in the late ‘60s and provides a wide range of creamy, dynamic fuzz effects with an almost endless amount of sustain for soloing and chunky rhythms. The Opto Stomp is a transparent optical compressor that provides a wide range of soft-knee compression effects, reminiscent of the best vintage compressors made in the 60s. In the software version, the Time1/Time2 switch label is changed to MONO (Time1 delay) and STEREO (Time1: left delay time, Time2: right delay time), and results in having a mono and stereo vintage delay that can create an amazing range of space effects. 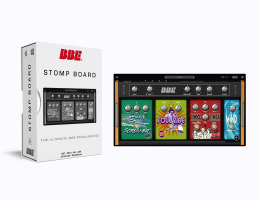 Download a trial version of BBE Stomp Board from the download page here.